This is a pretty solid cast announcement. Oh boy, more Seth Rogan. The rest of the cast sounds pretty good though. Wow, that’s some serious star power. Yeah, I’m there. 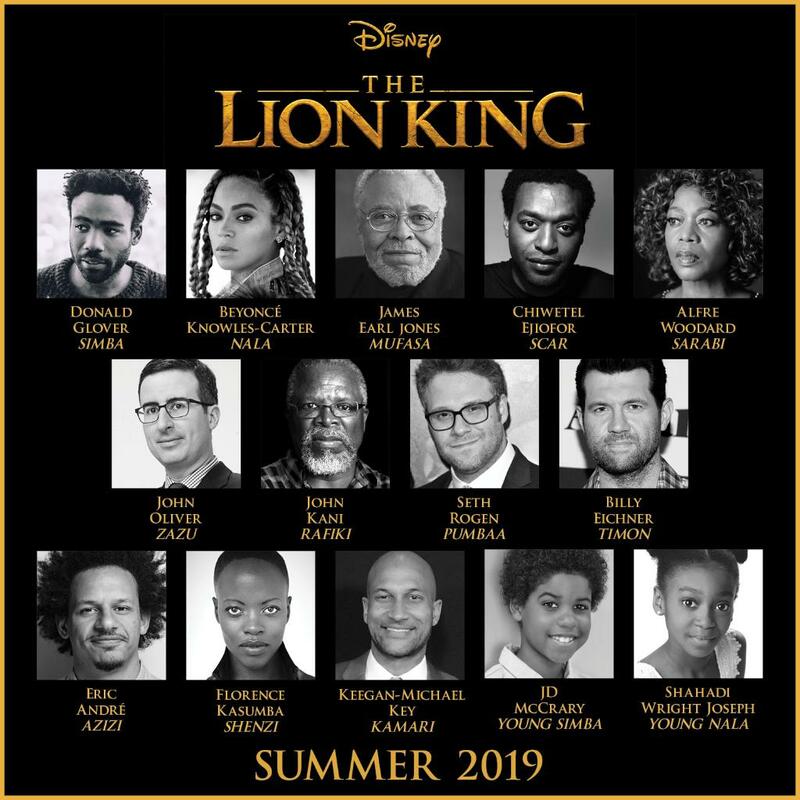 While the casting is all good, it unfortunately drops the secret joke of the original film’s casting, which was that Simba’s parents were Prince Akeem’s parents from Coming to America. I don’t remember which hyena is which (other than “the one that was Whoopi Goldberg”), so I can’t comment on those much. I jus realized recently that Rowan Atkinson was Zazu in the original film. Say what you will about his film work, but anybody who’s seen Black Adder will agree that Atkinson has a keen appreciation for Shakespeare, and surely well understood that he was in a version of Hamlet. I don’t know how much that informed his performance (if at all), but I think it’s notable because John Oliver doesn’t seem to have the same background. Also, I really want to see the unused takes where Billy Eichner plays Timon as…you know, Billy Eichner. Ejiofor is a great pick for Scar. Wow, CG has come a long way. That looks just like James Earl Jones. Yeah, we all saw it come on during the game, and everyone here went nuts. They nailed that ad. JungleBook… 2.0! Animals look good, but after another two hours of them doing real-looking things I hope they break into some kind of hallucinogenic dance or something. Probably just me, but something rubs me the wrong way about this. I don’t mind remakes in general, but doing the same thing down to iconic shots and sets - just with modern CGI - feels a bit lame. I found the Jungle Book remake fairly watchable and the CGI work was really great. However, re-creating moments of the original JB movie was hit’n miss for me. The Bare Necessities worked for me in the context of the movie - but King Louie all of a sudden breaking out into a song felt out of place and seemed to clash with the overall tone of that scene. Yeah, that’s why I’d prefer a flick where they have CGI real animals doing crazy wacky things for two hours, even if it gets cheesy, than real animals walking around heavily, wagging their lips. The shots of the water buffalo look straight out of JungleBook… feels like an easy cash-in, except for the billion man-hours of artist work. I think it is odd to have a remake and use James Earl Jones again. All due respect to James Earl Jones he’s getting to old to do voice work well. It clearly showed in Rogue One with his Vader work. Just get a quality voice double that can give watchers that “old school” deep voice. No kidding. This trailer is all iconic shots from the original, and the last line line is “Remember”. This is basically a Ready Player One crass nostalgia-hey-remember-when-you-were-young-and-everything-wasn’t-doomed cash in. Remember how colorful and gorgeous the Lion King animated movie was? Have you seen the Lion King musical, with the amazing colorful puppetry and sets? CG makes everything better didn’t you know? I’ve switched to CG breakfast cereal, and CG underwear. People keep calling this one live-action, but it’s obviously entirely CG and it drives me up the wall.